Before coming to Washington, I saw in my own work on the ground how crucial Supplemental Security Income (SSI) and Social Security Disability Insurance (SSDI) – two programs administered by the Social Security Administration (SSA) – were for people with disabilities who were experiencing homelessness. Often, SSI/SSDI are the primary source of income for these individuals, and can be used to pay for essential needs like housing, household items, and medical care or supplies. Simply put, SSI/SSDI benefits, in concert with other programs, can help individuals experiencing homelessness transition into stable and permanent housing. These benefits serve as a lifeline. 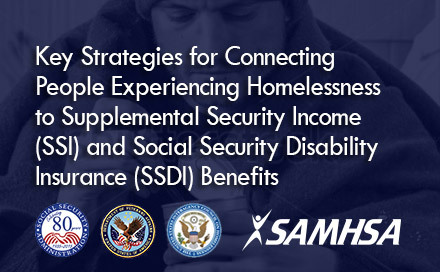 That’s why I encourage all organizations that provide homeless services to read our latest resource, Key Strategies for Connecting People Experiencing Homelessness to SSI and SSDI Benefits. For people with disabilities who experience homelessness, it is often a challenge to navigate the SSI/SSDI application processes. Individuals often lack required identification and other forms of documentation. Because of their limited access to ongoing health care services, they often don’t have current or quality medical records that document their disabilities. In spite of the fact that many people experiencing homelessness are eligible for SSI/SSDI benefits, their inability to document a disability can be a major barrier to receiving them. Compounding this issue, individuals may not have a way to receive correspondence by mail, have limited experience working with computers, or limited access to the internet to take advantage of faster electronic processes. Because of these challenges, many people experiencing homelessness often do not complete the SSI/SSDI application process, experience longer application and processing times, or have their applications denied due to lack of information. All organizations that provide homeless services, including health care, behavioral health, and social services, as well as faith and community-based organizations, have a role to play in helping people experiencing homelessness access SSI/SSDI benefits. Key Strategies for Connecting People Experiencing Homelessness to SSI and SSDI Benefits, which we developed in partnership with SSA, Department of Health and Human Services (HHS), Substance Abuse and Mental Health Services Administration (SAMHSA), and Department of Veterans Affairs (VA), focuses on how providers can assist individuals with the initial disability application and medical determination process. The guidance is also intended to help improve collaboration among SSA Field Offices and homeless service providers. The Key Strategies are informed by many of the best practices developed and proven to be effective by SAMSHA’s SSI/SSDI Outreach, Access, and Recovery (SOAR) program. SOAR is designed to increase access to the disability income benefit programs administered by SSA for eligible adults who are experiencing or at risk of homelessness and have a mental illness, medical impairment, and/or a co-occurring substance use disorder. To get trained in the SOAR model, check out their website. Lindsay Knotts is Policy Advisor at USICH, where she is responsible for coordinating Federal policy efforts for the Council.